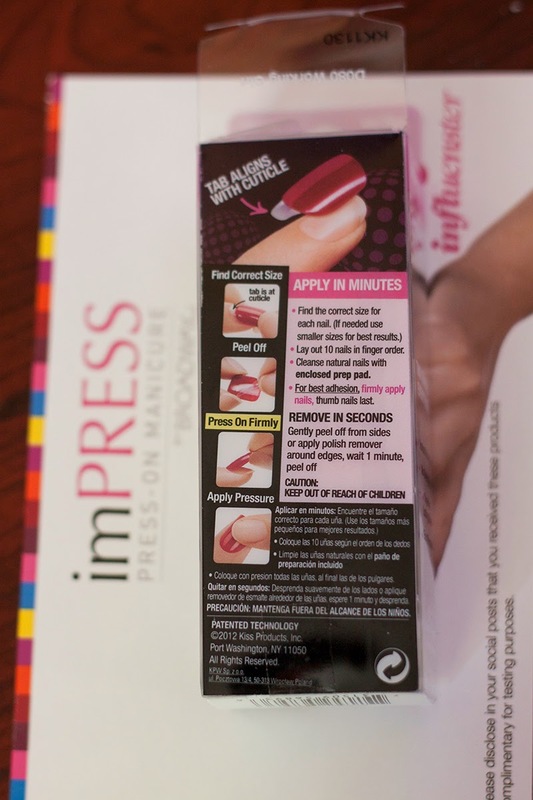 imPRESS: Press-on Manicure by Broadway REVIEW - Filosophie! I admit, I'm lazy with my nails. I used to love spending quality time creating intricate designs and patterns freehand but I just don't have time anymore. I rarely even paint my nails a solid colour because I'll have to clean them up shortly after. I don't like fake nails or shellac because they prevent your nails from breathing creating weak nails. Press on's seem to be made for me but I've had bad experiences. You know the drill, you put them on, have a scratch and they've fallen off. 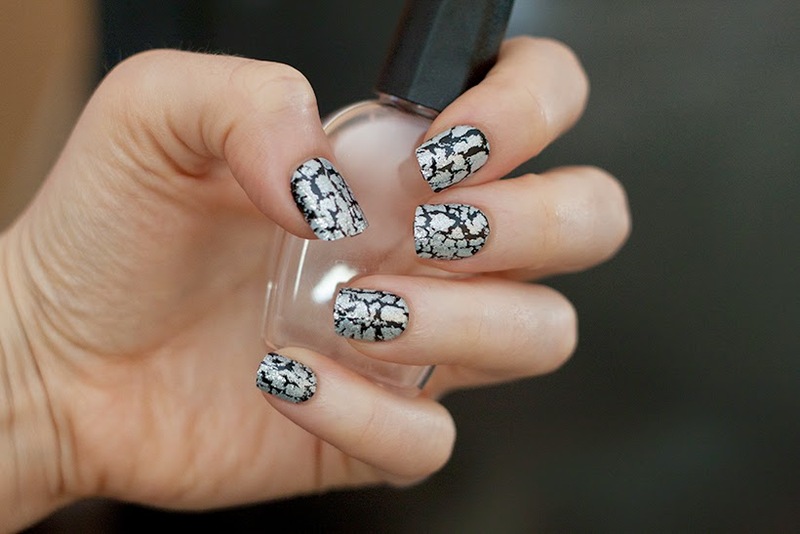 DESIGN: I got two designs to work with, this lovely cracked pattern and a beautiful lace pattern. I decided to go with this bold pattern because I'm feeling quite edgy recently. The black is matte while the silver has sparkles on them. The sparkles are quite subtle until the light hits them. COMFORT: They're comfortable, they're not long so they don't interfere with my everyday tasks (writing this is a breeze). The length is pretty ideal for me as they seem like a natural length I generally keep my own nails at. APPLICATION: Simple. Match the sizes to your nails (they suggest putting thumb nails on last for easier application, I obliged), clean your nails with the prep pad (I imagine it's just alcohol to clean your nails), peel off the plastic part (don't pull so hard else you can bend the nail. I held the bottom part then pulled the plastic upward), press and VOILA! Took m e a matter of minutes to put on! PURCHASE: I would buy these, the card says they're priced at $8.99-$10.99 and you do get extras -24 nails, so you can do your toes too! That's pretty reasonable. I think these would be perfect for interviews (design depending, I work in the beauty industry and I just know I'm going to get asked about them) and special occasions, especially if you're in a rush. EDIT: So it's been a week and they stayed on really well! I took them off because my nails grew and my hair was getting stuck by the bottom bits, also I missed having a good scratch. You know when you get fake nails and the tips are dull so you have to scratch extra hard? haha can't get around that! Only one of my nails came off pretty easily. These are really, really great. My only con was that the sparkle part near the tips for some of them faded within a few days but this is likely because of normal wear and tear. 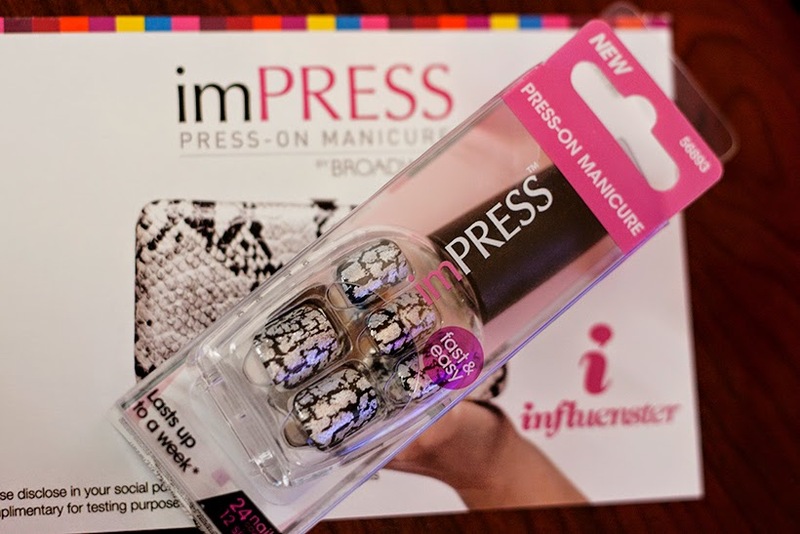 Disclaimer: I received these products complimentary from Influenster for testing purposes. My opinions are my own.